Washington Square Park first came into being as a Park in the 1850’s. It was a Potter’s field (a “common” burial ground) from 1797-1825. It is believed that up to 20,000 people were buried there (and are still there) from that time period. In mid-to-late January of this year, while excavating the park during their “renovation,” City workers found at least 4 intact skeletons and 70-80 human bones. Manhattan Borough Parks Commissioner William Castro asserted previously to the community in front of local Community Board 2 – to address concerns about precisely this issue – that the Parks Department would not be digging more than 1-3 feet deep. The city then proceeded to dig from 7 to 11 feet below grade. 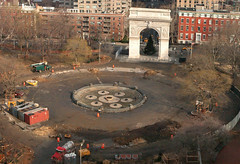 NYC 24 blog has a new story about the bones resurfacing in Washington Square Park. And, of course, digging up skeletons can have many meanings. Skeletons ‘of our past’ means interfering with the historical and emotional center of our beings — which is exactly what New York City is attempting to do with their excavation of Washington Square Park. Not that I am looking for a mention, but I wanted to let you know that I just now added a link to this blog on my NY blog. Thanks for keeping me up to date! And the Dwarf of City Hall, Boss Bloomberg himself, would be the responsible one, along with his buddies Adrian “I’m Robert Moses” Benepe and Henry “Cut the Socialist Crap” Stern. This is a very good blog, very interesting and relevant to our communities. I was wondering where did they put all those bodies? That should be public knowledge and would have been nice for them to be reburied in the park. It was terrible thing to do and not necessary at all to change that park. Bloomberg has been busy trying to make NY into a Long Island mall. He’s just as stupid as his buddy who ruled before him. He runs this place like a corporation, not a city full of individuals, full of human beings and he hates park animals.